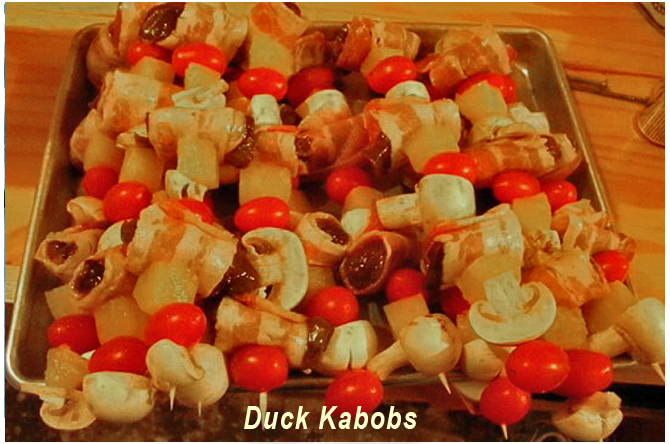 Duck Kabobs are easy to prepare, fun and delicious! This is a great way to "use up" that last duck or two and also works well with Pheasant and other wild game. We cut each fillet into 4 small pieces, wrap each piece with 1/2 slice of bacon and alternate pieces on a skewer. Use whichever veggies or fruits you like best. Pictured here, we used Mushroom halves, Cherry Tomatoes and Pineapple. Cook on grill or broiler until bacon is crispy. Barbequing your ducks is the easiest, fastest and super-delicious way serve up a great duck dinner. We start with one duck per serving. Fillet and clean the breast sections, marinade, wrap with bacon and BBQ like a petite steak for about 6 minutes per side. Duck should never be over-cooked and is best served medium rare. By the way, you can use this recipe for Venison too. Marinade: 1/3 Cup Soy Sauce, 1/2 Cup Olive Oil, 1 Onion Sliced >> Mix contents and marinade duck breasts in plastic container or gallon size zip-loc bag. We marinade for at least a couple of hours, but overnight is even better. 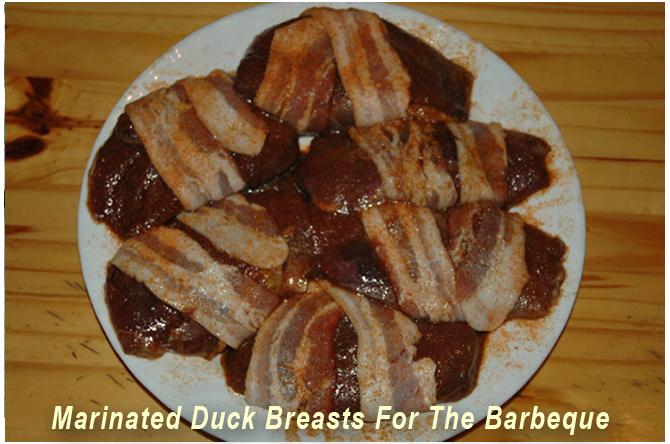 Remove duck from marinade, wrap each breast with a single strip of bacon and place on pre-heated grill or broiler.